I apologize for the sudden disappearance. I did not intent to. I was seeing myself getting no time at all for the blog or even to sit down and check my mail, but I had not seen myself staying away for this long. Especially since I had so many posts in the draft, all incomplete though. The events and the schedules of the past few weeks acquired a whirlwind speed. I just have to tell myself that things will remain this way. The family is a priority here and blogging being a hobby it was sidetracked. Personally I feel I needed this break. Sorry! I know I have responsibilities here too. All I can say at this time is I see this happening again and I will not be able to post as frequently as I used to. However the blog at this point for more than five hundred recipes, so those of you who are eager to try out, make sure you go through the Recipe Index. Today’s dish is an everyday dish. Bhindi is a common vegetables in almost every state in India and is made is a hundred different ways. Each state has its own treasured recipe from a simple stir fry like this one to more elaborate ones. With the summer vacation has snuggled up on us in the cozy blanket of a less hectic life, we are usually having a slower morning than the usual school year. Oh! what a relief! But now I have it upon me to cook a full sit down lunch. I have hungry kids to feed. We try to do a variety of lunch (which in this context would mean not Indian everyday). Whatever it is on the menu is effortless, light and something with takes little time. We want to spend the rest of the time doing everything we love to do and cannot do during the school year: like reading together in bed or until past midnight. Little relaxed pleasures of life. A simple Indian meal would include rice or roti (or any kind of homemade whole wheat flatbread), a dal or lentil dish, a side of one vegetable along with yogurt and a small salad, usually kachumber. The entire lunch does not take too long to put together. There is nothing fancy here, but the food is healthy, wholesome and complete. 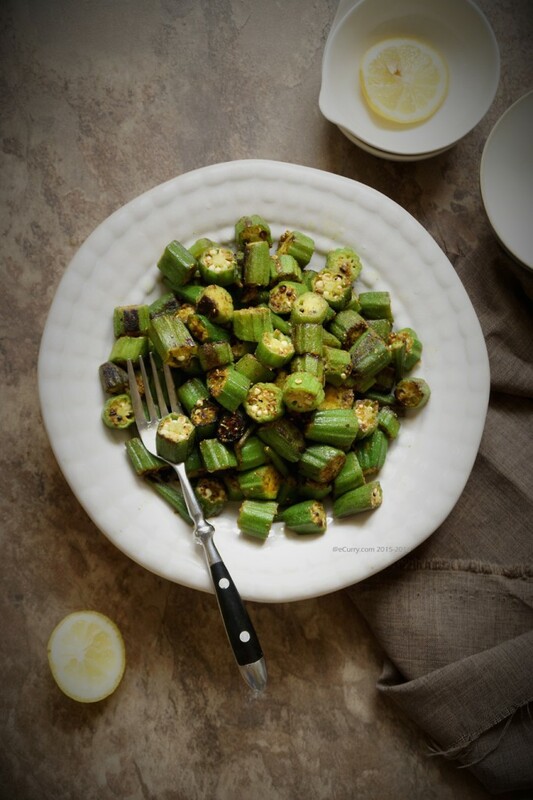 This is probably the simplest way to cook bhindi/okra the Indian way. Every state would use their regional spices for flavoring. What I have done today has the soothing flavors of coriander, hugging the tender slices of okra or bhindi. No onion or garlic is used here. The vegetable is cooked just until tender. The slight tart of the dried mango powder (or lemon juice) balances the flavors. Make sure the coriander powder is good. You can buy the seeds and grind them in a spice or coffee grinder and store in airtight containers for about a couple of months. Store bought powders, even the fresh brands have lost most of the flavors by the time it has reached your pantry. 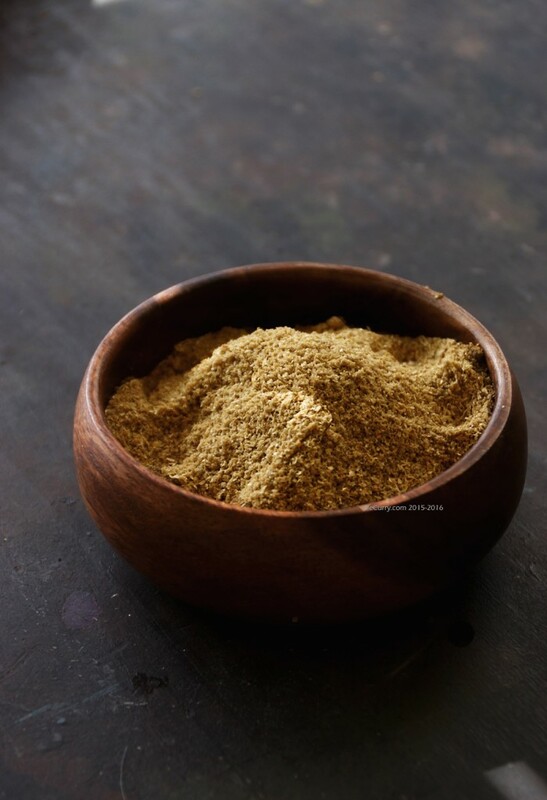 The use of methi or the fenugreek seeds is something which I have started only recently. It adds a subtle depth of flavor. If they are not available, go ahead and make the dish without it. Choose tender young okras/bhindi. The mature ones get tough to be eaten. 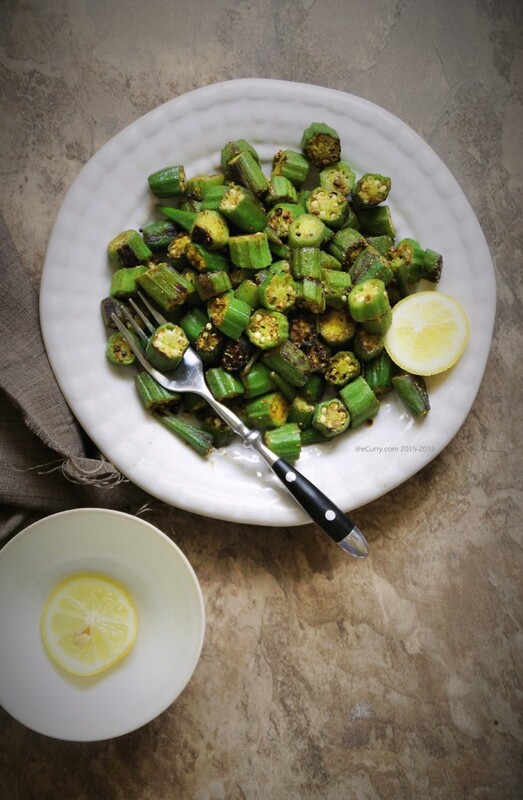 Wash the bhindi/okra. Pat dry them with a towel. Start chopping with taking off the stem end first. Chop in half inch size, approximately. Wipe the knife frequently to wipe off the slime. Arrange the slices in a single layer if possible in a large plate or tray and allow it to air dry for at least thirty minutes. Heat oil in a pan or large wok. If the okra/bhindi is not overcrowded in the pan it is better. Having them in an almost single layer helps to dry off the slime. Add the hing/asafoetida and then the cumin, mustard and the fenugreek seeds to the heated oil. When the spices sizzle, add the okra/bhindi slices. Toss quickly for the oil to coat the slices. Cook for five minutes and then add the turmeric. Toss gently again for the turmeric to coat the slices evenly. Cook at medium to high heat uncovered. Do not stir or toss too much. 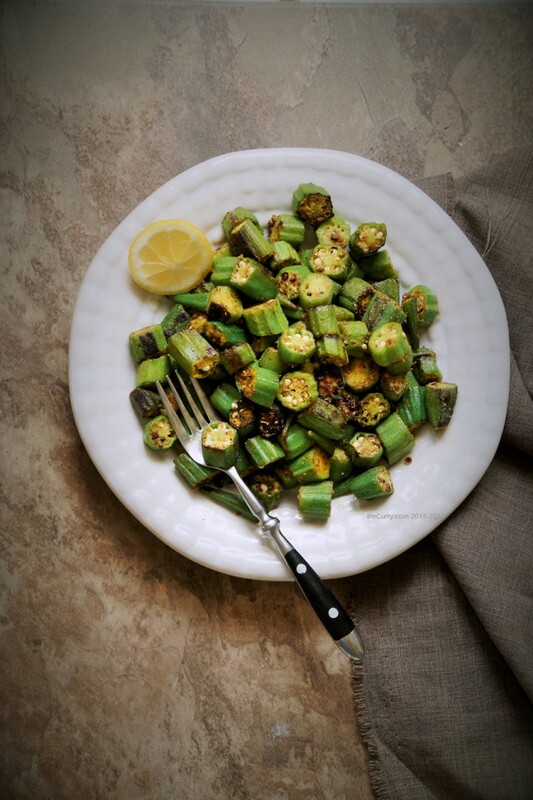 If the bhindi/okra is tender, they will cook in about 10-12 minutes. Toss only a couple of times during the cooking process to make sure that they are not turning too brown. Browned at the edges is okay. Otherwise the okra/bhindi should remain green and still slightly crisp to bite. By the end of the cooking process they would have been tender too, the raw taste gone. Now add the salt and coriander powder. At high heat toss well for the coriander powder to coat the slices well. If you would be using red chilli powder add it now. Cook for about 2 – 3 minutes and then add the aamchur. Toss gently again, cook for a minute, and switch off the heat. If you are using lemon juice instead of aamchur add it after switching off the heat. If you are using fresh cilantro/coriander add before you serve. Serve hot and preferably immediately as a side. In Indian cuisine the dish is served with a side of rice or roti (or any flatbread) and a dal. June 24th, 2015 | Category: Dry Fries, Sides & etc. 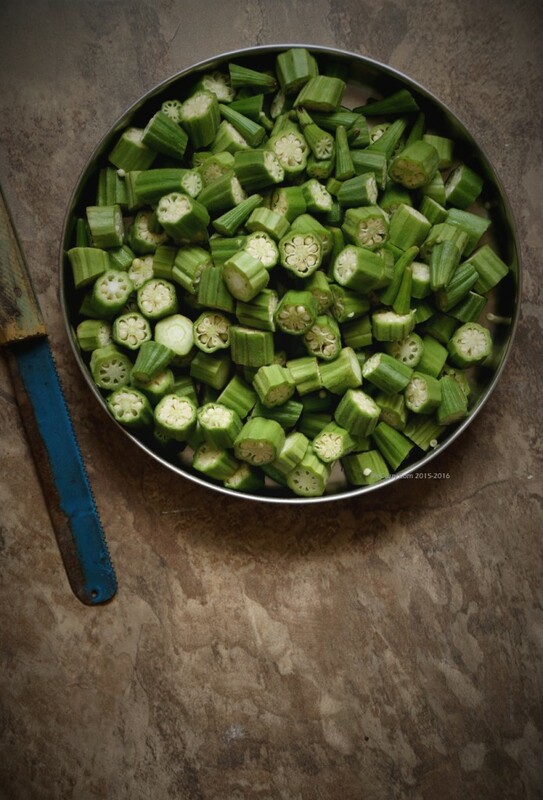 Here is the Ode to Okra – https://sloword.wordpress.com/2014/02/06/okra/ Does have a recipe at the end, so be patient! Good to see you back, Soma. Needless to say, your posts were missed, but as they say, no news good news, and as children grow so do family obligations so please don’t feel bad if you can’t find the time or concentration for blogging – you’re doing a very important job in your family and must make the most of your time with your children. Before you know it, they will have grown up and left the nest, but now they need you. And don’t forget, you have provided us with more than 500 delicious recipes and many charming stories , plenty for us all to be getting along with for now……(and by the way, the Lemon Pickle without oil turned out so delicious I’ll be making it again with the new lemon harvest!! Thanks a lot. Do I keep it in the fridge now?). wishing you a wonderful summer! Thank you so much for understanding! Yes I am already seeing the empty nest and all the more reason I feel like spending more and more time with them 🙂 I am sorry I did not reply to your comment on the pickle. It is only now that I am slowly going to the piled comments left. Sorry for the negligence. A good sun cooked pickle usually does not need to be regrigerated. Back home they would bask in the summer sun and we stored them for the whole year without refrigerating, give they are in airtight containers and “sunned” once in a while. The oil prevents it from going bad too. I am not sure about this one and I have refrigerated mine given we had so much humidity this year. However I will ask Manisha and confirm 🙂 Thanks for your patience! Thank you so much and thanks for understanding! Thank you! Hopefully I will not have to disappear again. The most important thing when you cook okra is to buy the right kind. You need to get the tender ones. The more mature they get, the tougher they are. The way to test it is to snap the tip of the okra. If they break easily they are good. if they bend and not break they are fibrous and not good to buy. I am in the same position. Can’t even sit down to think about writing anything for the blog. Don’t apologize. A hobby is to relax and feel good about it. It shouldn’t be a stress. It spoils the whole of a hobby. I haven’t blogged for months but I know I have other priorities to sort out. I am kind of embarrassed to say it but I have never cooked okra before. (I know it is shameful)I really just had no idea how. But this recipes looks great. Such a combination of flavors. I am sharing it straight away!